Each year, the meeting industry’s premier awards program salutes outstanding properties, venues and destinations in varied prestigious categories. These exceptional hospitality brands are voted upon by thousands of Smart Meetings’ subscribers and dedicated meeting professionals nationwide, and continue to play a vital role in the meeting planner community. 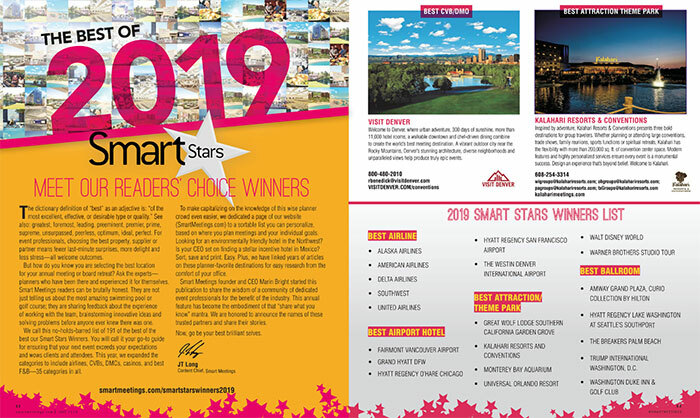 If you have a favorite property, venue or destination that helped make your event a smashing success, honor their commitment to excellence and cast your vote for the 2019 Smart Stars Awards. Bonus: you’ll be automatically entered to win a stay at a winning Smart Stars property! Review the 2019 ballot of distinguished hospitality brands or submit your own nomination using the form below. Submitting your vote is quick and easy and you’ll help to shine the spotlight on your favorite brands. Remember, you’ll be automatically entered to win a stay at a Smart Stars winning property!